I did the unthinkable. I still can't believe I did it; something magical, something so beautiful I thought it only existed in dreams. I made matcha chips. Yes, yes I love tea. Blah blah blah, I say it so many times I don't think I need to say it again. I'm always searching for new ways to get tea into my baked goods and people, I have struck the tea-in-baked-goods gold! I was inspired on a day of boredom to create such goodness. I've recently seen Nutella being made into chips, which of course, I plan on making soon as well - I mean, come on, how could I not? With the last bit of my matcha, I decided to mix it into some melted white chocolate and voila! 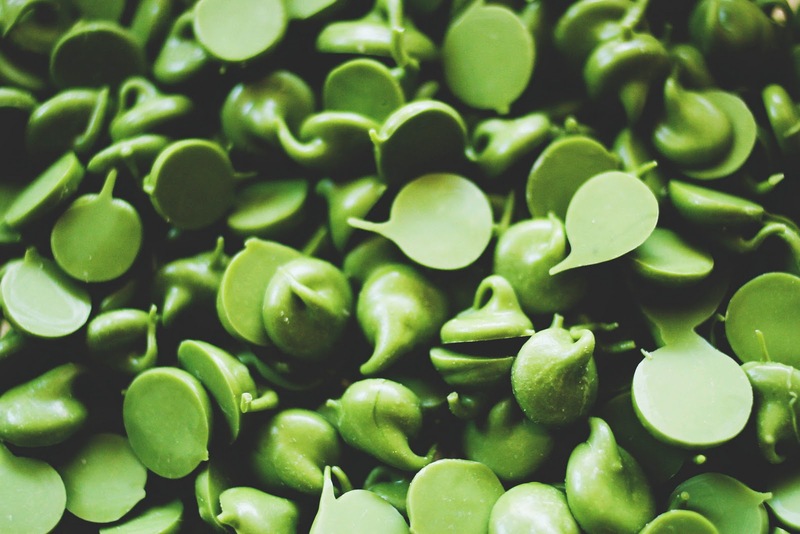 Matcha chips, literally in 10 minutes. It... could... not... be... simpler! Kermit, you were surely wrong. It is very easy being green - especially when you are as lovely as Matcha. I mean come on with that stunning color! Of course, I had to toss these into these a chewy cookie batter and then nom, nom, nom on them as if my life depended on it! Oy vey... such is the life of a baker. About the matcha chips, I only had 1 tablespoon of matcha powder left, so that's what I added to my melted white chocolate. After they had hardened, and I popped one in my mouth, the matcha flavor was not as distinct as I had wanted them to be, so in the recipe, I upped the amount to 2 tablespoons. 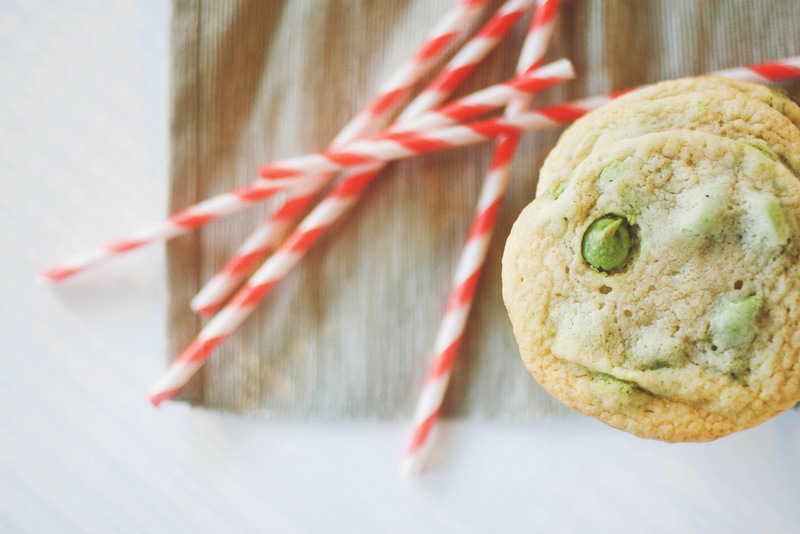 Although, after being baked into the cookies, the matcha flavor was a bit more prominent - score! But next time, I still would double the matcha since a "pow" of matcha flavor is highly welcomed. 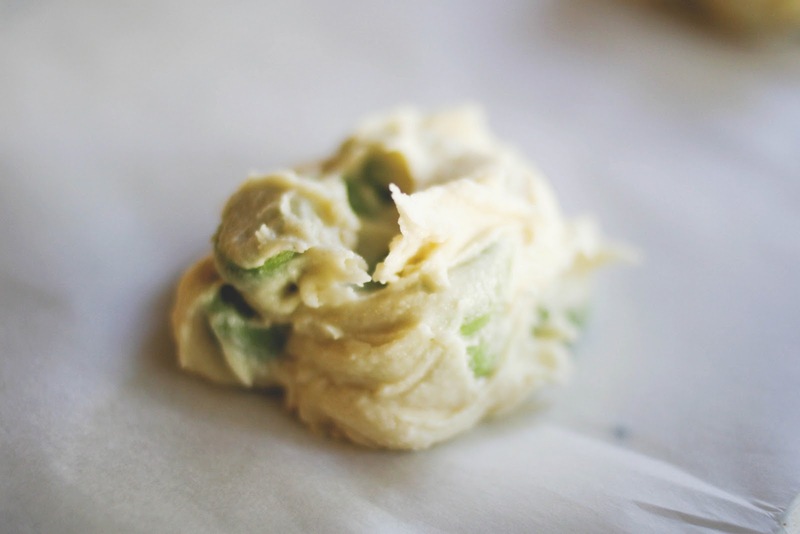 To make the matcha chips, carefully melt the white chocolate over a double boiler, making sure not to burn it. 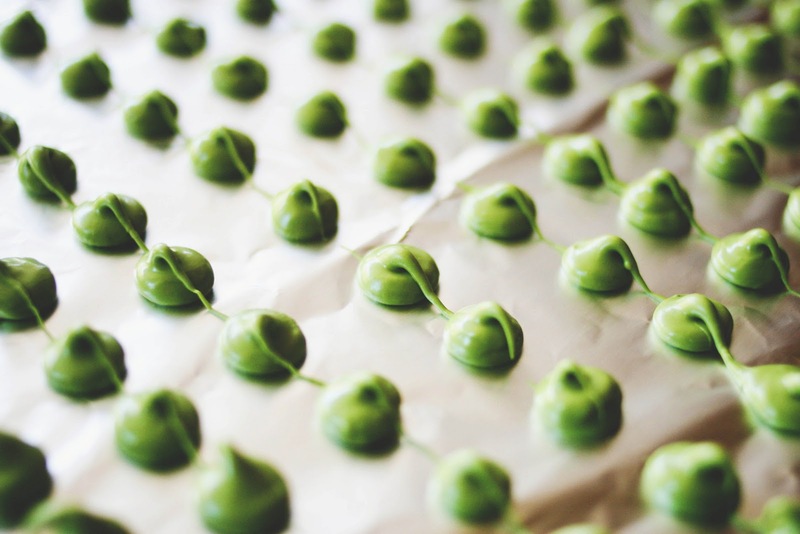 Once smooth, whisk in the matcha powder until smooth. Transfer to a piping bag and pipe into 'chips' onto a piece of foil. Allow to harden completely, about 1 hour or you can speed this up in the freezer. To make the cookies, preheat the oven to 350 F. Line a cookie sheet with parchment paper, set aside. In a small bowl, stir together the flour, baking soda, baking powder and salt; set aside. Using a mixer, beat together the butter and sugar until very smooth and fluffy. Beat in the egg, vanilla and green tea. Gradually blend in the dry ingredients until well combined. Fold in the matcha chips carefully. Roll rounded tablespoonfuls of dough, then place on the prepared cookie sheet, about 1 1/2" apart. Use your palm to press them down slightly. Bake for 8 - 10 minutes or until lightly browned. Let stand on cookie sheet for 2 minutes before removing to cool completely on a rack. 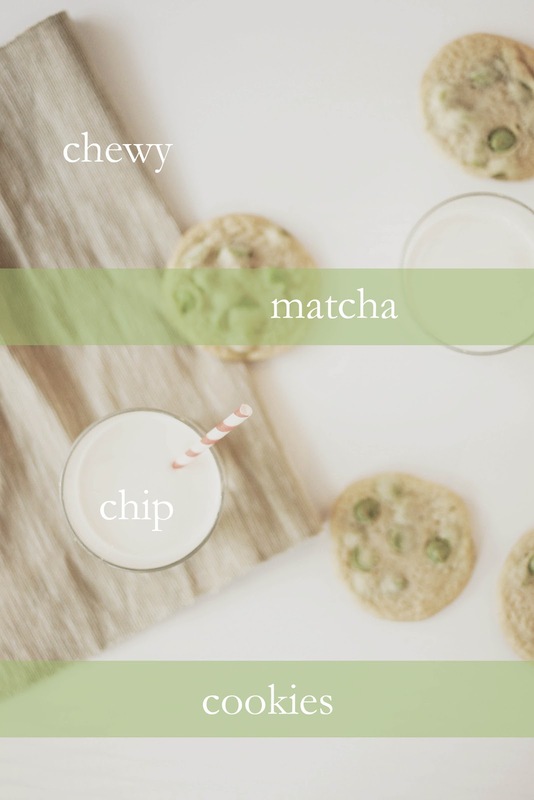 Matcha chips? Omfg, you are a genius. Genius!!! I am making these post-haste! Wow, you really are a genius! Im so excited to experiment with this! Man are you some kinda genius, Michelle! And they LOOK like real chips too. SQUEE. Definitely gonna have to play around with this idea =D. Such a great idea and they look so good!!! Thank you for sharing! these look SO good! you're so creative! Love this!! will have to try it out! your chips look so incredibly perfect!! @ Julo: tell me how you like them!! @ urbanite jewelry: yayyy for matcha twins! seriously though, isn't matcha like the best thing on earth? How awesome are these cookies, you are so smart, I can't wait to try. Thanks so much for the idea. When I first saw the pic on foodgawker I thought it was salad. I love this! I admit that I'm not the world's biggest white chocolate fan. But I often have it on hand for recipes. This will give me a way to use up my leftover white chocolate in much tastier way. I really love your idea!! This looks delicious! My fiancée love greentea so much that she will be in heaven. I will try to make it at home. Thanks for sharing! Ingenious! You know I love matcha too. I never thought to make my own chips though! OMG, this opens so many possibilities for desserts. Esp for the holidays that require green. Those matcha chips look awesome! What kind of tip did you use to pipe them? Or did you use a tip? I just have to say this is the coolest, most creative thing I've seen in a long time. What a fantastic idea. Your photos are incredible as well. These chips are sooooo fun! Go you. I love matcha in every which way. bet these are awesome cookies! Such a great idea. 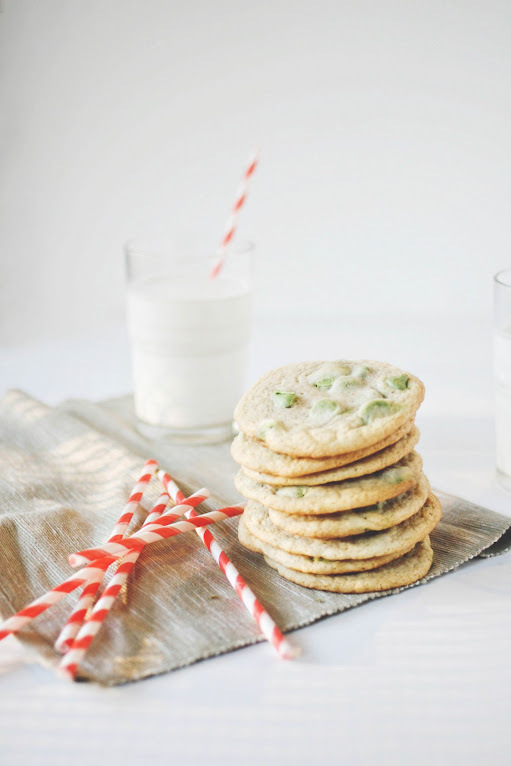 I have done this with semi-sweet chocolate/orange (and mint) but wow, white chocolate/matcha is a home run! Since green tea and chocolate go so well together (IMO) I am sure what would work too! I love anything matcha flavored and the color is gorgeous! 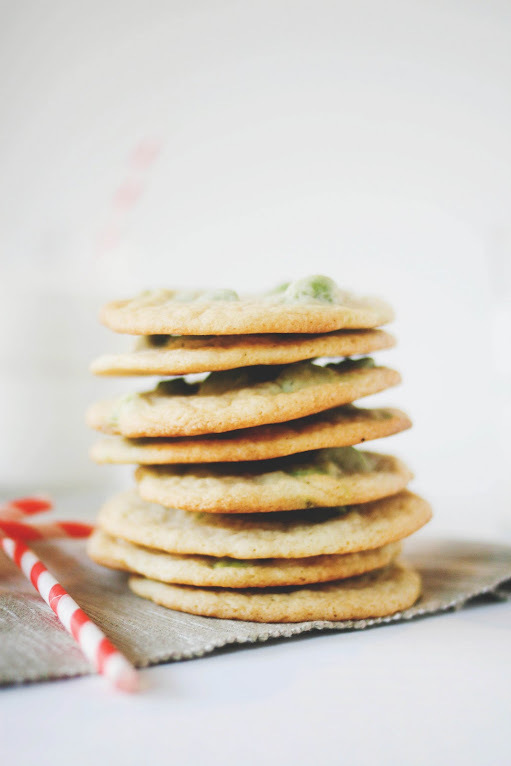 oh, I´m SO making these cookies Michelle!. You were right, you are SO brilliant! Yum. 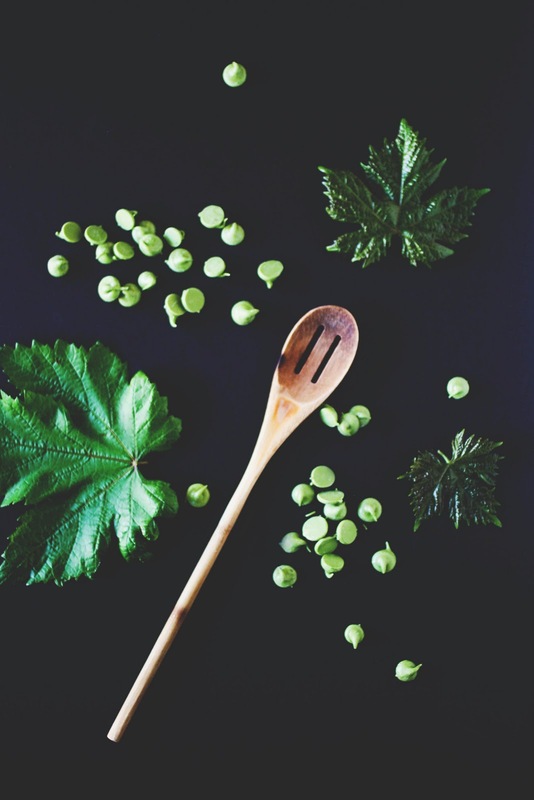 Pardon my total ignorance, but where does one find Matcha powder? I'm almost flailing at the computer, these look so amazing! Definitely going in my recipes bookmarks! I tried making the chips and it would drain out the tip. If I let it cool, it would cool off before I was done and harden in the bag. Any suggestions? But, I think cooling the chocolate a little before piping it out onto a sheet would really help in the liquid-y factor, but of course not for too long or else it will get too hard! So Can I ask there is any different between the green tea powder and the strong-brewed green tea??? @Tatiana Phung: There is a large difference between matcha green tea and strong brewed green tea! Matcha has a completely different flavor and is wayyyy more concentrated than any strong brewed green tea. Also, in using them in these cookies you cannot add liquid to the chocolate because it will curdle. If you want, you could use green tea leaves instead, it will just have a bit of a different flavor, but still delicious! I have never heard of anything so creative, amazing, and makes me drool so much! I LOVE tea and tried making tea-infused frosting only it turned out horribly, but these cookies look great! Definitely want to try this and with other tea powders!! Look forward to more tea food! I can't wait to try these...I love anything made with matcha....this definitely takes it to the next step. These look absolutely matchalicious, but what kind of white chocolate did you use?